This rubber pad is designed to protect your front bumper from abrasion, scratch, and other damaging marks, it also can cover the existing scratches or paint damages. With carbon fiber texture, gives your car a more aggressive and customized look. Made by high quality PU soft rubber material, soft, good elasticity and great pulling force which is very durable and long lasting. It has good insulation, flame resistance and small deformation, high reliability. It can effectively guard it against abrasion, scratches, crashing, and other damaging marks. With existing arc and flexible enough to conform to different types front bumper or car body. Comes with double sided self-adhesive tape, easy to install and remove without damaging the car paint. 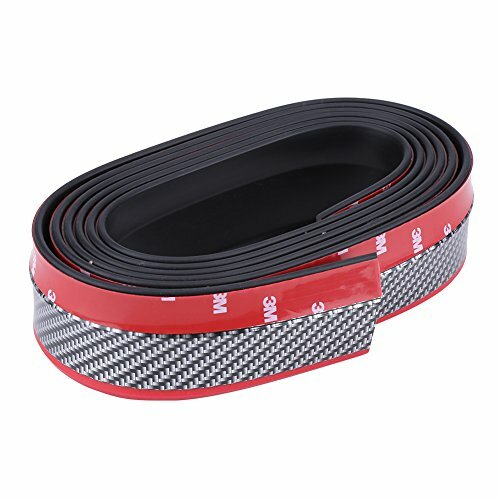 With carbon fiber texture, increase both car body protection and aggressive and customized racing style. 1. Clean underside of the bumper to ensure that it is clean and no oil, no grease, no wax and so on. 2. Find the correct install position before removing the tape protective film on the products. 3. Peel the backing off of one end of the tape, and slowly peel it while pasting. 4. You can also heat the adhesive tape under the item to increase the stickiness if you have hot hair dryer. 5. If you need a stronger, more permanent attachment, you may use screws to secure the lip to the bumper.